← 83 Radisson Rewards hotels will be more expensive March 1 – book now! Phnom Penh used to be tough to get around, but thangs to technology it’s just as easy as in Europe or the US – but a lot cheaper and more fun, too! You can ride in the comfort of a luxury SUV or in the back of an open-air rikshaw, all organized by ride hailing apps on your phone. Public buses or trains are available as well, but scant so far and often not worth the saving unless you are on a very tight budget. Find out tips to get from Phnom Penh Airport to the city, including grab, and around the city! Getting to/from Phnom Penh Airport to the city: Phnom Penh Airport is about 12km West of downtown. It’s about a 40 minute ride by taxi, but it can turn into 90-120 minutes during rush hour due to the increasingly gridlocked roads of the capital. Outside the terminal, you’ll find official taxis that should charge $12-18, depending on the distance. But they might try to get higher fares from foreigners, so feel free to push back! If you want to avoid the hassle, you can book a private taxi online for $15-29, depending on the car or van you choose, making this great value! A nice Lexus RX like in the photo will be $15, a van for a larger group $22-29. Or you can use one of the many ride hailing apps operating in Phnom Penh, including grap, that will charge less than $10 for a car and lower rates for tuk tuk, riksha or motorcycle! They’ll wait for you outside the airport along the road, so leave the terminal and head to the street exit before you hail one – mine accepted within seconds and was just steps away Get more tips in my grab Cambodia review! Royal Railway launched train service from the airport to the city and trains are supposed to have seats and air conditioning. They go to the North of downtown and take about 45 minutes and you’ll need a ride from there to most hotels afterwards. While trains were supposed to run every 20 minutes, on my last visit there were only a handful of trains per day, requiring me to wait several hours! While I’m a big fan of trains, this is not really practical for visitors. Getting Around Phnom Penh: The most common sight in Phnom Penh’s old town are tuk tuks, carriages for 2-4 people drawn by motorcycles. You can find them on every street corners with drivers either offering rides – or taking a nap. Rides around town should be $1-2, but require negotiations to get a fair price. 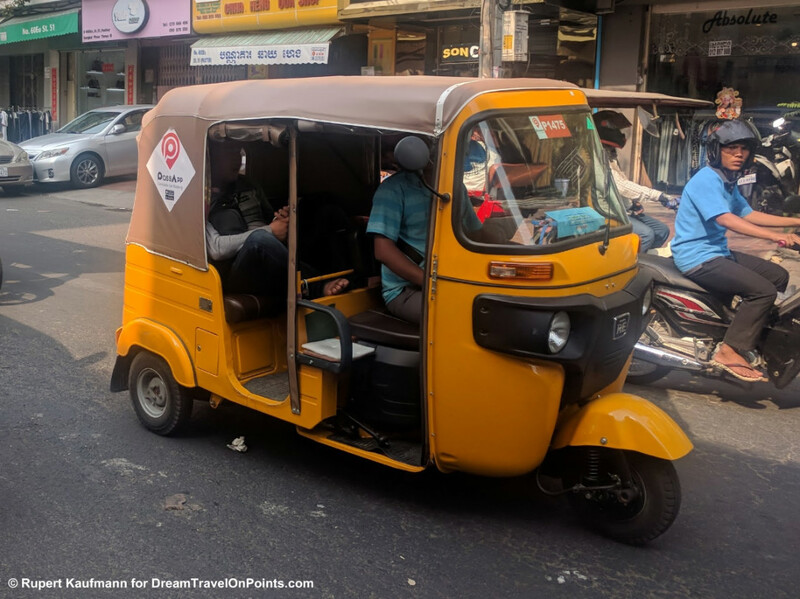 An import from India are the new, motorized rikshas that you see zipping through town, usually in bright colors, with room for 2 people (or 3 skinny locals). They charge about the same price as the larger tuk tuks. Both are open air, no a/c here! Fortunately, you can now avoid all the haggling and call them right from your mobile phone! You can use local ride hailing app PassApp and it worked like a charm, but you’ll pay by cash. I thought it was hilarious that you could book a vehicle decidedly from the last century with technology of this century, but it worked really well and is inexpensive. If this is your first trip to Cambodia, you should give it a try! 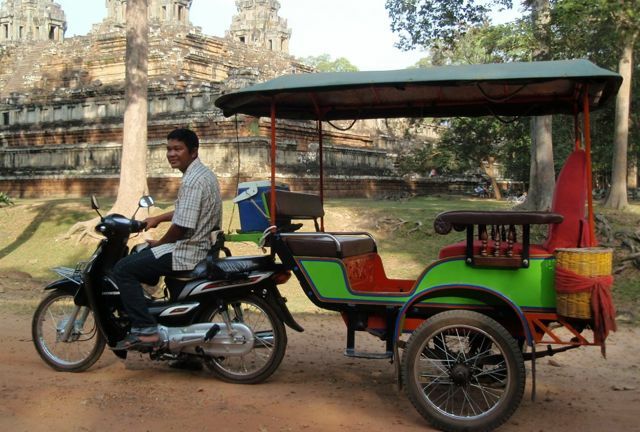 You can also use grab Cambodia for a more traditional taxi, riksha or tuk tuk. Rides around town are $1-5, depending on the mode of transportation and you can pay by credit card or cash. 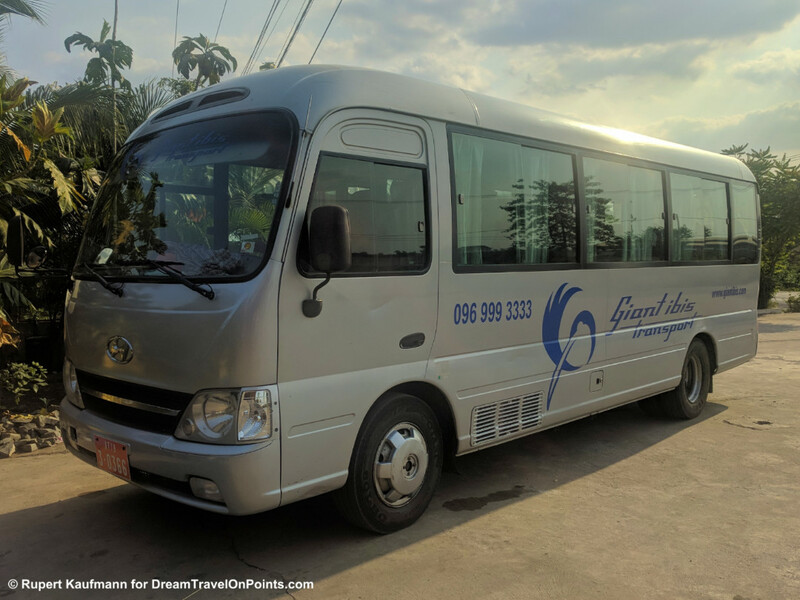 Getting to/from Phnom Penh: If Phnom Penh is your spring board to Cambodia and you are traveling on a budget or a planning to visit Kampot or the beaches around Sihanoukville, you might want to consider a bus to get you there. There are numerous bus companies offering trips to Kampot (3h), Sihanoukville (4h) or even Siem Reap (6h). Two reputable companies popular with expats living in Cambodia are Giant Ibis and Mekong Express. I rode with Giant Ibis and the service was professional, the bus and driver safe and the departure time reliable. Staff speaks English and you can even book your tickets online! There are a lot of local companies that are a little cheaper, but many of them offer poor service, will do pick-ups that can add 1-2h to your trip and are not really safe. You may have unsafe drivers, old vehicles and hazardous cargo. One of my trips involved a crazy driver, a rickety old bus with worn out seats and no working a/c and a cargo of 500 liters of fuel in leaky plastic canisters – an accident would probably have ended in a fireball! I’d avoid them and pay a dollar more to ride with Giant Ibis or Mekong Express!